It's story time in this edition of Retards in the Government. Stories of murder and corruption. Same old story. The story of politics in the Philippines. How hard is it to say they do not condone such antics? 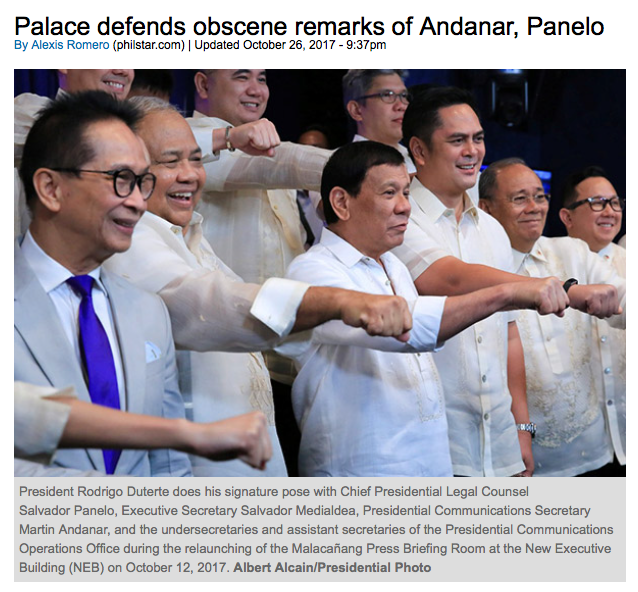 Toleration of obscenity by government officials speaking publicly and as representatives of the Philippines is madness. 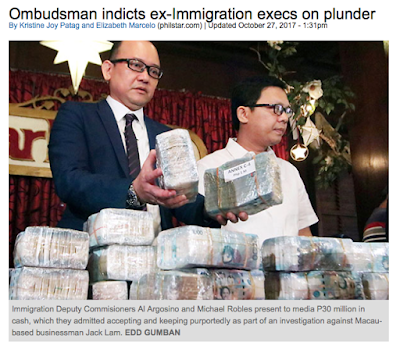 Why would the administration condone officials presenting this kind of image of the Philippines while abroad? 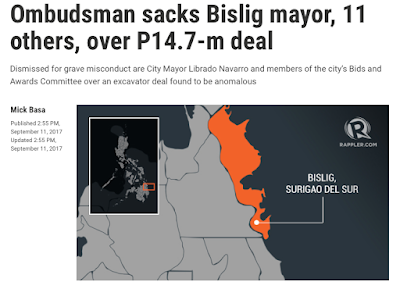 Radio journalist Christopher Lozada filed a grave misconduct complaint against the mayor of Bisilig. 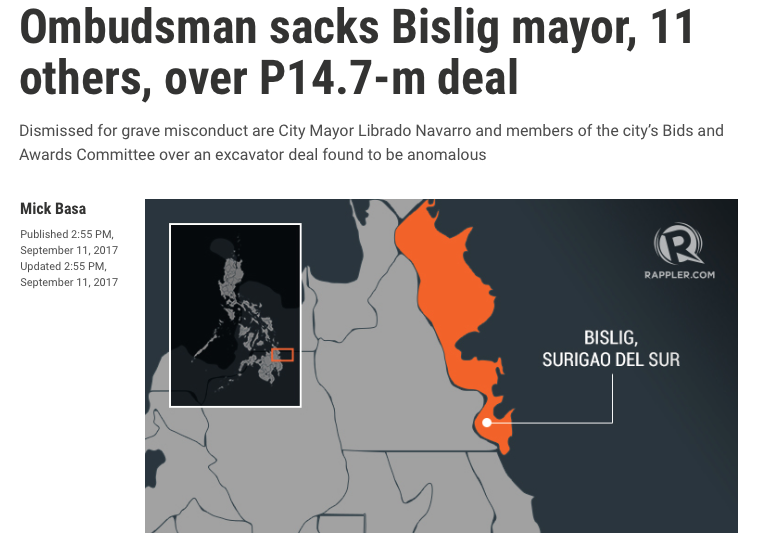 The ombudsman investigated and judged that misconduct occurred and ordered the dismissal of the mayor and several others. 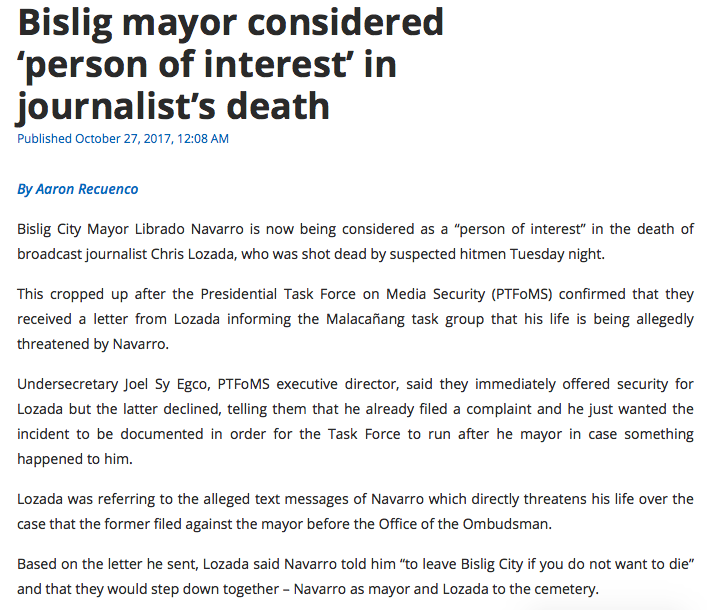 Lozada claims the disgraced mayor sent him death threats and now Lozada is dead with the ex-mayor being a prime suspect. 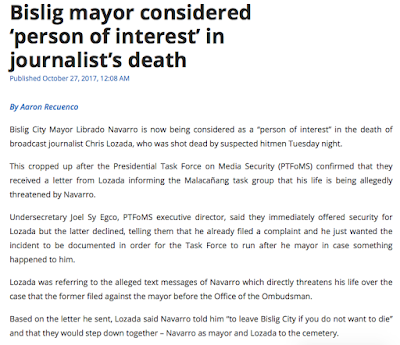 "On October 24, PTFoMS sent a strongly-worded letter to Navarro, warning him 'to desist from threatening Christopher Lozada' and stating, 'in case any untoward incident happens to him, we will include you (the mayor) as possible perpetrator of the same.' 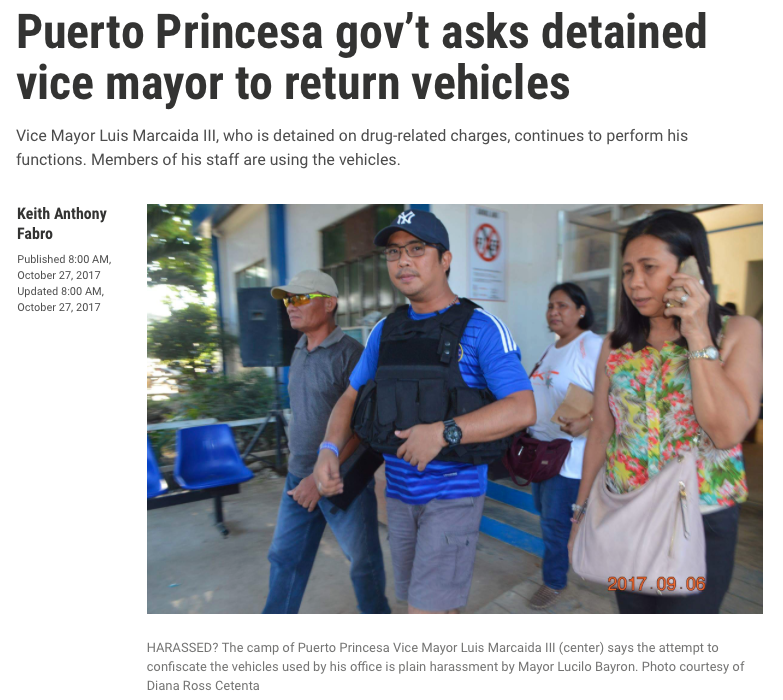 Sadly, Lozada was killed even before the letter-warning could reach the mayor," the task force said. Blaming the slow postal service for a man's murder is a new one. Perhaps now there will be some reform within the postal system. Corupt policemen are nothing new. 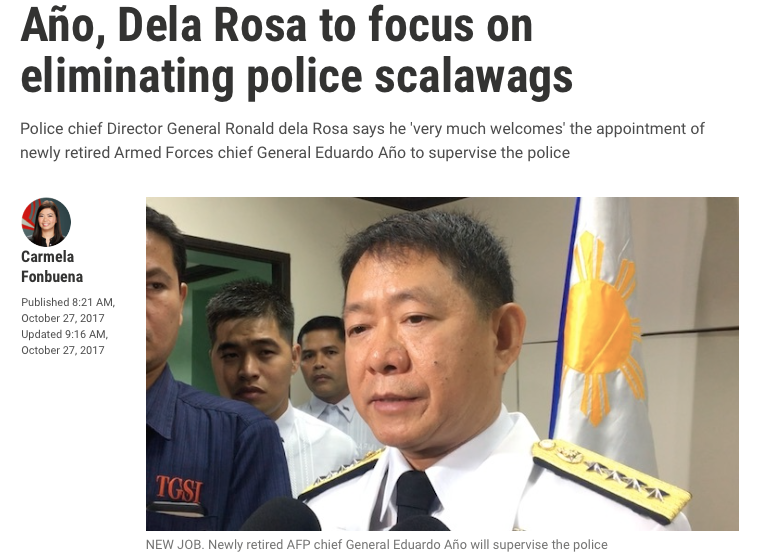 What is new is that Duterte has put former AFP Chief Año in charge of rooting out scallywags within the ranks of the PNP. 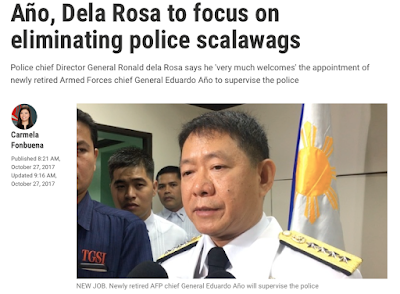 Does Bato not have the will or influence to make these scurvy dogs walk the plank? 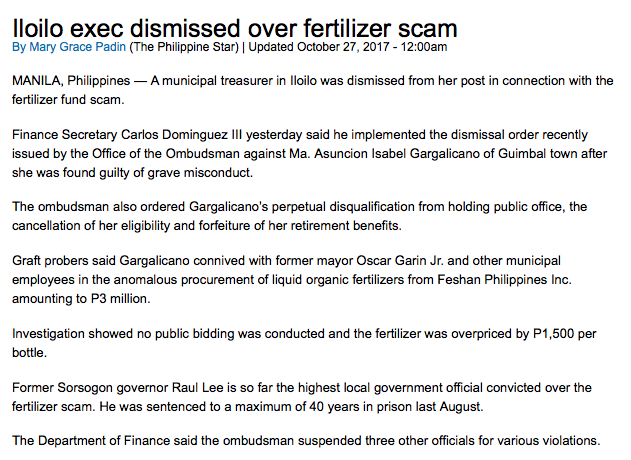 The fact that they have to address the problem of corruption within the ranks of the PNP in this very public way shows that corruption runs deep. But everybody already knows that. 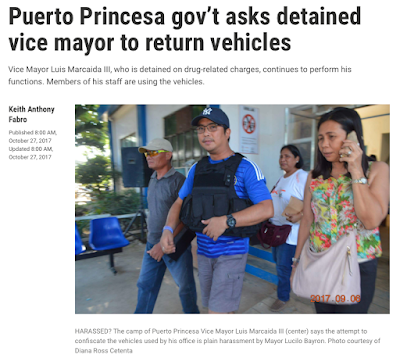 How is this guy still performing his functions as Vice Mayor while behind bars? 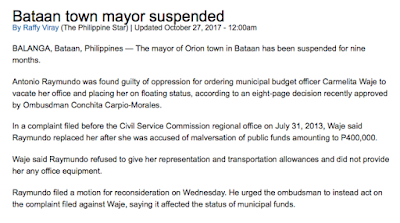 What is the acting Vice Mayor doing if he is still able to perform his functions? How does he have staff working for him? 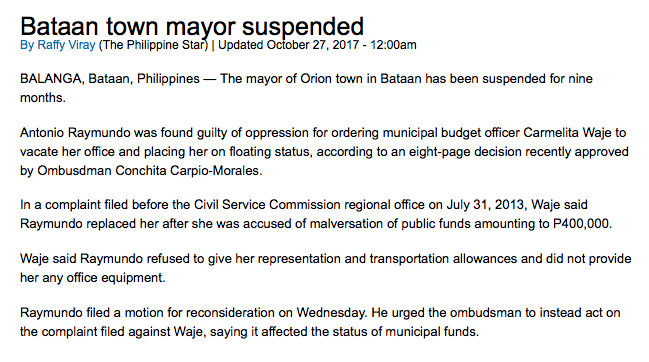 Shouldn't they be working for the acting Vice Mayor? It doesn't make any sense. 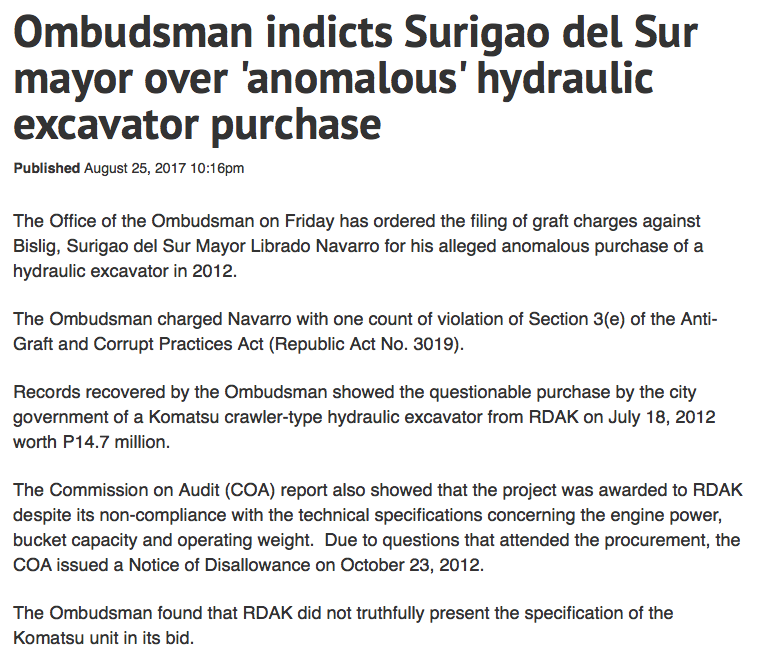 More ordinary corruption amongst government officials. "The Office of the Presidential Spokesperson said the comment was posted by a former page administrator who is no longer connected with the office," the statement said. 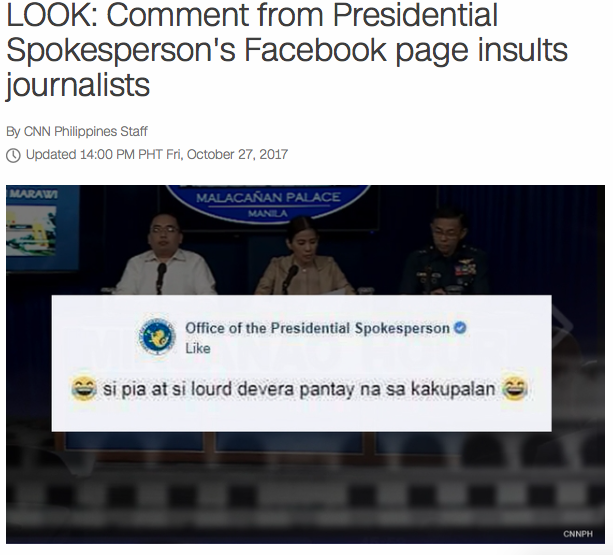 "The said comment does not reflect the official and personal views of the Presidential Spokesperson or his office on the individuals being referred to," it said, adding that the administrator's access to the page "was immediately removed." What's the big deal? If they can defend the obscenities of Panelo and Andanar why do they condemn this Facebook post? 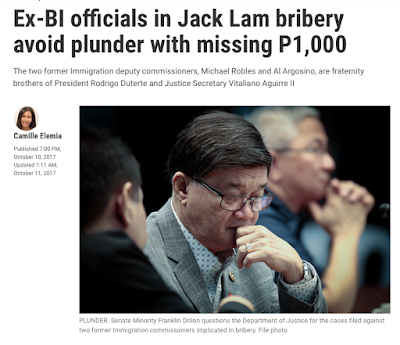 Two ex-BI officials, Argosino and Robles, are accused of extorting 50 million pesos from a Chinese businessman in order to overlook 1,316 illegal Chinese workers. These two men were appointed by Duterte at the recommendation of Aguirre. 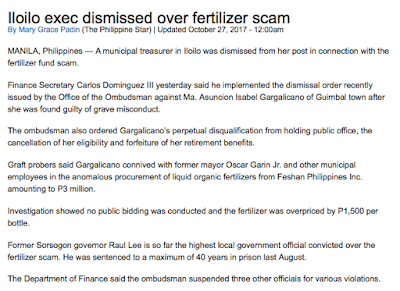 All four men, Duterte, Aguirre, Argosino, and Robles all happen to be fraternity bothers. 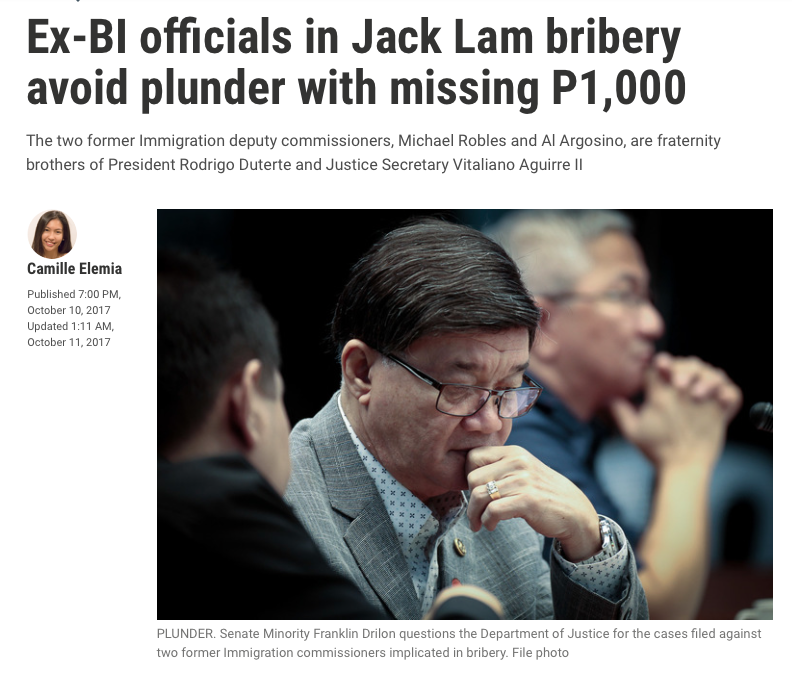 Now it just so happens that when the 50 million was counted there was only 49,999,000 pesos which is 1,000 pesos shy of being eligible for a plunder charge. 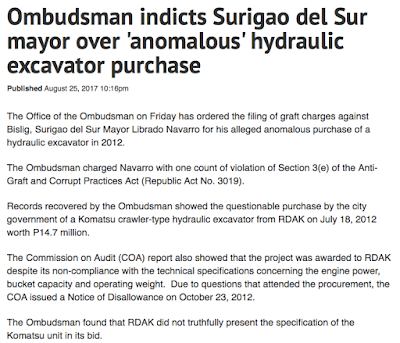 The Ombudsman was not having any of it and recommended the plunder charges anyway. The moral of the story is that Filipinos value loyalty above all no matter what. 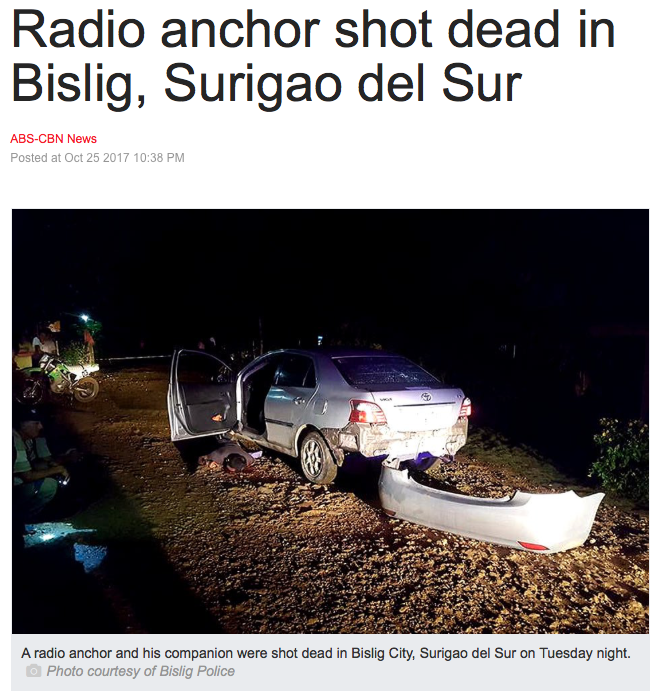 The recent hazing death of a UST fraternity pledge and he subsequent cover up is a testimony to how tight lipped and protective of their own these groups can be. Loyalty is rewarded. Utang na loob. It is fairly obvious that Duterte is attempting to protect his fraternity brothers despite being forced to fire them for such obvious corruption. 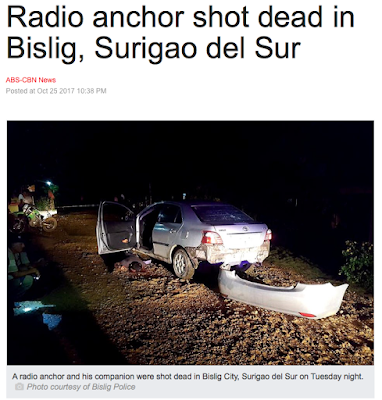 This is case that runs deep and could potentially implicate even Duterte. 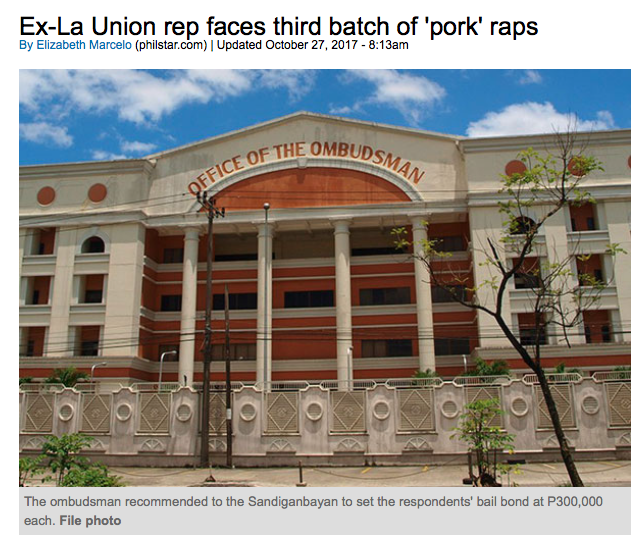 No wonder they want to impeach Ombudsman Morales. They need someone who will play ball. Not someone who will expose their crimes.